It’s one part of the kitchen that gets overlooked I think. If you’re lucky enough to have a separate space away from the main kitchen, where you can house your utility items then that’s fantastic. I envy you! Being able to take the washing machine and dishwasher out of the kitchen and pop them away from view creates a lovelier kitchen, but we don’t all have that luxury. So I’ve been thinking about how to make the kitchen look good when you need to include your white goods, and how you shouldn’t neglect a utility room either. Here are some of my ideas for making these areas stylish. Oh how I long for a utility room! For me the perfect utility would be compact and contain my dishwasher, washing machine and tumble drier, shoe store, coat store and scooters. Then I’d be able to create a downstairs loo in my ‘under the stairs’ cupboard once many of these items had been re-homed. Victorian house designers never considered these things you see. One of the problems with a utility room I suspect though, is neglect. It would be easy to create a mess (I’m not suggesting this is what you do of course, but I know it would happen in my home) and then just shut the door and leave it for later. There’s no reason why this room can’t look just as stylish as the rest of the house. Maybe it would be a pathway to the back doorway, or to an office perhaps, so it needs to look good if people are going to be walking through it all the time. Think about the kitchen décor and colours and continue this theme through into the utility. Continuity into a smaller room like this is essential I think. In modern houses I’ve seen lower grade fittings used, with cheaper worktops and cupboards but if you can afford to, use the same fixtures and fittings as the main kitchen. You will need good storage and shelving, space to store laundry, or dry laundry even, and cupboards to hold the household cleaning equipment. If you’re going to display some of this try and buy matching sets to add a little fun to the room. It’s still a part of your home so add your favourite wall art or family pictures to make it feel lived in. I know we can’t all afford a SMEG appliance but I just love the fun and quirky lettering for the wall in this image below. I love the grey walls in this next image which I think creates a striking backdrop for the white shelves and units and the silver appliances. Matching appliances like this would work well in the main kitchen too. And finally, how about this one for bright colour and fantastic storage! I know it won’t be for everyone but it’s fun and will definitely brighten the dullest of chores. Becky from Family Budgeting has been doing up her kitchen on a budget and she’s a big fan of red, I know she’d love this! Not got the luxury of a separate utility room like me? Well fear not there are still tips and tricks you can use to ensure your kitchen looks fab. I think the first most obvious one is to buy an integrated dishwasher, which you can get pretty much anywhere these days. If not, then do look at some of the more stylish brands (although they tend to cost more) so you can make the item a style statement in its own right. 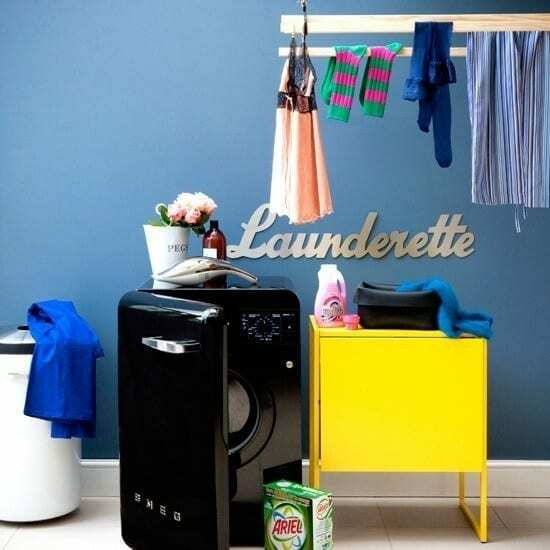 For washing machines and tumble driers, these can be housed in cupboards if you have the space. One can stack on top of the other. But again, if this isn’t possible go for the most stylish looking one you can find and afford. Try and ensure your white goods have the same style, and ‘blend’ into the rest of the kitchen. Got white cupboards, go for white appliances. Like a little silver effect in your kitchen, go for polished stainless steel on your fridge and then silver on your washer. 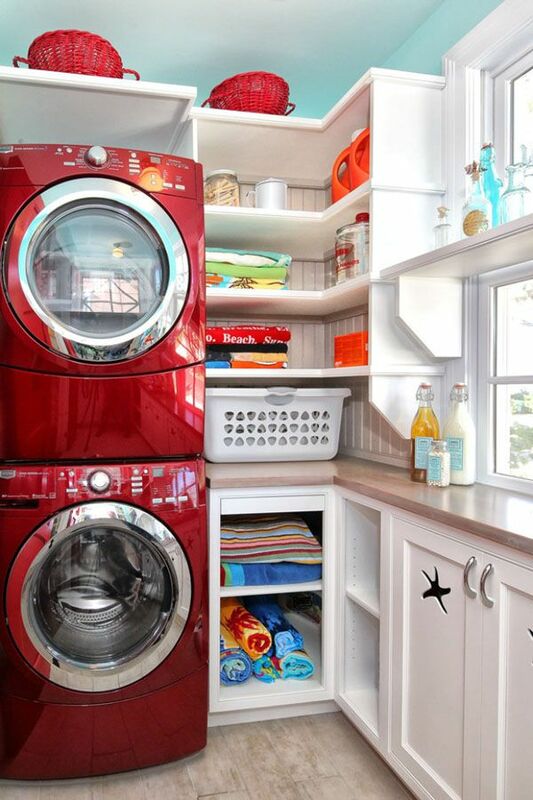 And if you love colour, be bold and daring and get your appliances in a range of them. Colourful appliances, both big and small are all over the shops now so you’ll be spoilt for choice. So there we have it, there are lots of ways to create a stylish utility area whether it’s in a separate room or housed within the main kitchen. 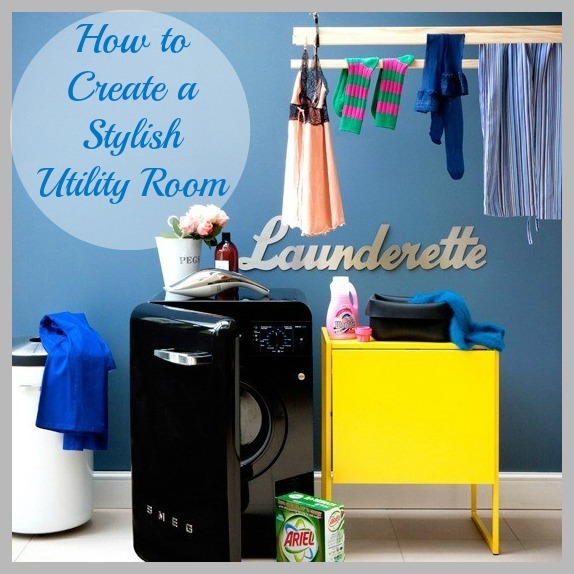 Do you have any tips for keeping your utility looking fabulous? Let us know in the comments. I really should get your advice the next time you are at mine, on my utility. I definitely need to tweak it, but its very small, and needs to be storage for all sorts of things. It just doesn’t work though, it could do with being twice the size, and I need more shelving. This Blog entry has made it to Pinterest (which is how I happen to be here). Interesting to get a non-North American perspective. 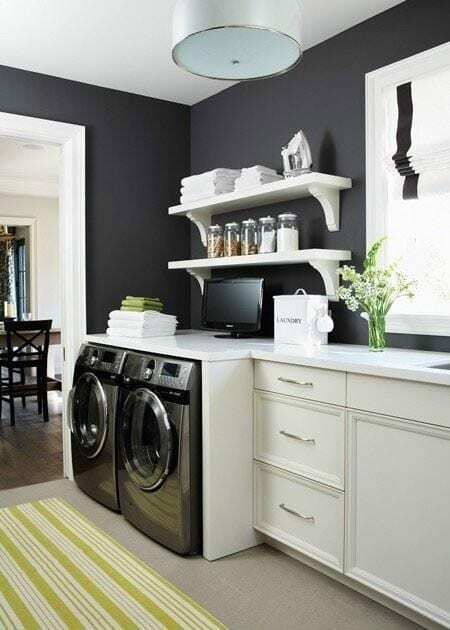 Here Laundry Rooms are the norm in most homes… be that a designated space in the Basement, the Main Floor or Upstairs. In some houses, it does double-duty on the Main Floor with a side, back or garage entryway with space for coats & boots etc. (When that is the case, the space is usually known as a Mudroom). Honestly, I couldn’t imagine putting my Dishwasher anywhere else than in my Kitchen… certainly not in the Laundry Room or Mudroom. Definitely would want my Dirty & Clean Dishes close to where they are stored / used.